The cDNA portion of each clone was amplified by PCR, using standard T3 and T7 primers. For manual spotting, 0.5 µl (about 0.2 µg) of the amplified cDNA was spotted in parallel onto Gene Screen Plus membranes (NEN Life Science Products, Boston, MA, USA) using an eight-channel pipetter. For automated spotting with the Q-bot (Genetix, Boston, MA, USA), a 96 pin gravity gridding head with 0.4mm pin diameter was used to spot the PCR products (about 0.4 µg DNA µl-1) in replicate on Gene Screen Plus membranes that had been soaked in 6 x SSC. 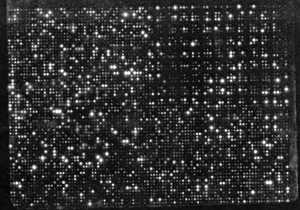 A 4x4 gridding pattern with an equal spot distance of 2250 µm was used. After spotting, nylon filters were positioned face up for 10 min onto Whatman paper soaked with denaturing solution (1.5 M NaCL, 0.5M NaOH), followed by 5 min of neutralization solution (1.5 M NaCl,1M Trizma Base), then dried and exposed at 120 joules cm-2 under a UV-crosslinker. For hybridization, 32P-labeled first strand cDNA probe was synthesized by reverse transcription of 30 µg total RNA using SuperScriptII reverse transcriptase according to manufacturers instructions (Stratagene). The RNA was isolated from P proteoid roots at different stages of development (10 DAE, 12 DAE and 14 DAE), and from +P and P normal roots and +P and P leaves at 14 DAE. Hybridizations were performed in 50% formamide, 0.5 M Na2HPO4, 0.25 M NaCl, 7% SDS, and 1 mM EDTA at 42°C. Blots were washed with three subsequent washes (1x SSC, 0.1% SDS; 0.5xSSC, 0.1% SDS; and 0.1xSSC, 0.1% SDS) at 42°C.